1. Albufeira beaches – located around 90 kms from the Spanish border. One of the most popular beaches in Portugal located in the touristy Albufeira. The city boasts a number of restaurants, beach bars, kids facilities, shops and most importantly easily accessible wide beaches. This makes Albufeira a great choice for family holidays. 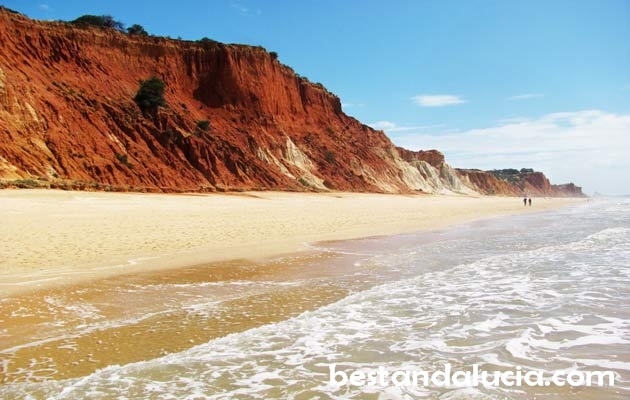 The Albuferia beaches are well-known for fine golden sand and stunning coastline full dotted with fancy cliffs. 2. Olhos de Agua beach – located around 85kms from the Spanish border. Stunning beach famous for amazing tall cliffs and spectacular sand. The beach is accessed by wooden steps. Olhos de Agua beach offers amazing views from the top of the cliffs – great spot for photographers. 3. Quarteira beaches – located around 78 kms from the Spanish border. Fantastic wide long beaches, with long promenade, located in the city of Quarteira which itself provides plenty of entertainment and shoreline accommodation to the tourists. The Quarteira beaches boast several breakwaters which make the water very safe for swimming. Another top spot for summer family holidays. 1. La Manga strip in Mar Menor – located around 95 kms from the Andalucia border. The Minor Sea is Europe’s largest lagoon and the La Manga beaches have been dubbed ‘a heaven between two seas.’La Manga boasts shallow and warm waters, perfect for young kids and older people. There is lots of restaurants around and a nice promenade. La Manga can get a bit busy in the summer in which case head for the nearby and much quieter Los Narejos beach. 2. Calblanque beach – located around 100kms from the Andalucia border. Situated in the nature reserve, Calblanque Natural Park, the beach stretches for more than 13 kms. The beach is quite popular among nudists and is characterised by wildlife, golden sand, sandbank sand rocky bays. If you are looking for a perfectly tranquil unspoiled beach, that’s one of the best places to go on Costa Calida. To access the beach take exit 800 on the A7 road between Alicante and Cartagena.In general, it is quite difficult to access. 3. Bolnuevo beach – located around 40kms from the Andalucia border. The 1,5 km long idyllic beach located in a small fishing village, just 6 kms from the town of Mazarron. Well-maintained, almost unspoilt. The Mazarron area boasts more than 30 km of amazing beaches full of small bays and cliffs, waiting to be explored.